Previous owners name inside front page. Good condition is defined as: a copy that has been read but remains in clean condition. All of the pages are intact and the cover is intact and the spine may show signs of wear. The book may have minor markings which are not specifically mentioned. Most items will be dispatched the same or the next working day. Very Good. 0849946158 ALL BOOKS SHIPPED WITHIN 1 DAY OF PURCHASE! I believe in God and heaven but this book was ridiculous. Angels carry swords and bows and arrows! God sits on a big throne!! All a load of rubbish. If this was genuinely the boys experiences then I think he has a vivid imagination. But I think this is a piece of right wing religious propaganda thought up by people with little faith who try to hide their doubts by pushing the literal translation of the Bible. it is utter rubbish - avoid at all costs. I had heard so much about the book that I had to get it and read it for myself. It opened up a whole new concept about Heaven and what it's like. Amazing story. I had read this book and then bought this one for a dear friend. She absolutely loved it. Can't wait for the movie to come out. Loved this book..... plan on handing it to others to share..... Thnx for having this copy. Yes, I believe it happened. 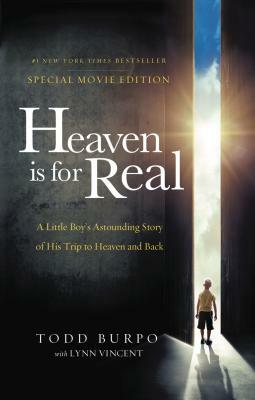 This is an incredible story of a little boy's experience of heaven - but it rings true. He meets his great grandfather. While he does not recognize a picture of him at age 64 before his death, he does pick him out of a picture of a family group when the man was 29! A must read for everyone who hopes to see life after death!